It’s officially National Fresh Fruit and Vegetables Month! 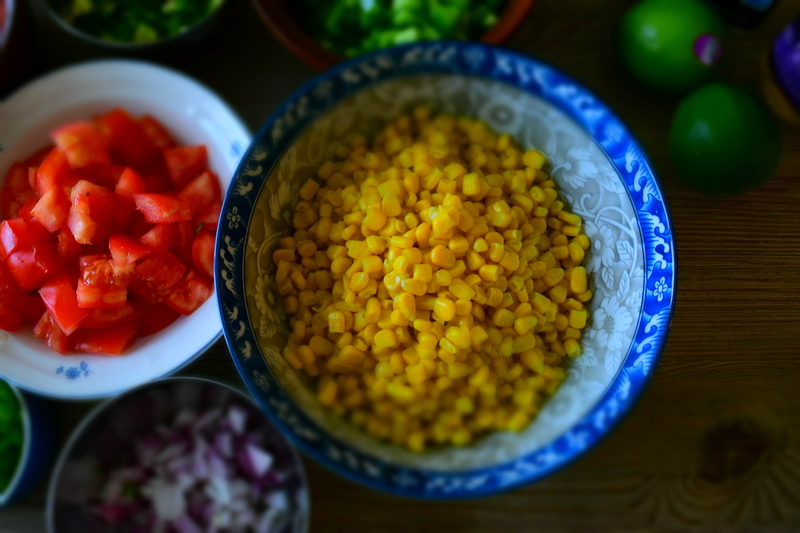 To celebrate, we have been testing different versions of corn salsa in search of that delicious bite of fresh, sweet, and tart. Y’know, the flavors that remind you of summer BBQs and bright, sunny days spent outdoors. 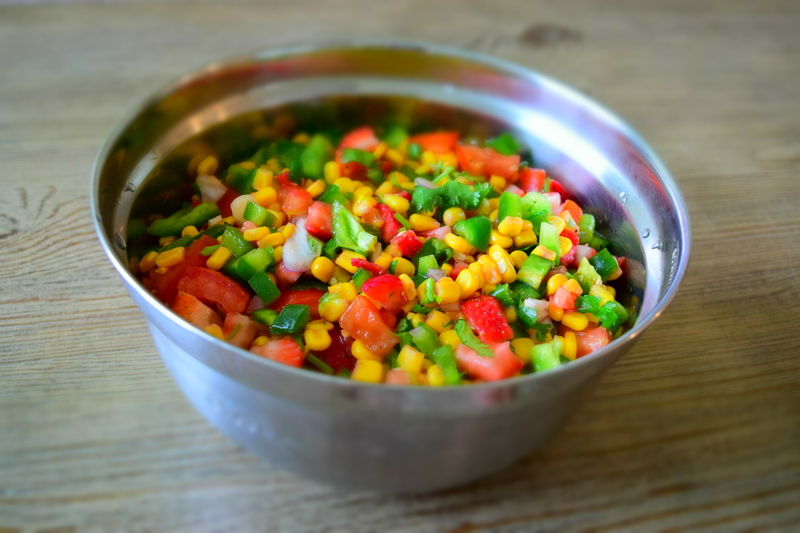 This version of Summer Corn Salsa has even more sweetness, with fresh strawberries tossed into the mix to round out the “fruit” in National Fresh Fruit and Vegetables Month. We won’t say it’s the best version there is, but it is pretty darn good! Once warm weather hits, strawberries are usually one of the first fruits to ripen in spring and early summer. You just know it’s the peak of strawberry season when your local farmers’ market stands fill-up with little green cartons of this sweet, tart fruit. Here in the Triangle, where Faithful Families lives, we are already well into peak strawberry season! How do I choose the sweet strawberries? All strawberries, whether really sweet or super tart, can be used in cooking and baking. So don’t be too afraid if you end up buying that beautiful-looking box of red strawberries, only to find them too tart to consume fresh (chocolate-covered strawberries, anybody?). However, if you are looking for tips on how to pick ready-to-eat, sweet berries, here’s how you can spot the ripe ones: choose the brightly colored berries that are dry and firm to the touch. Ripe berries will have a shine on them that make them look glossy. Avoid the ones that look shriveled, dull, and soft to the touch! How do I keep my strawberries from going bad so quickly? I f you don’t eat all your strawberries soon after buying them, they might start shriveling up in your fridge. 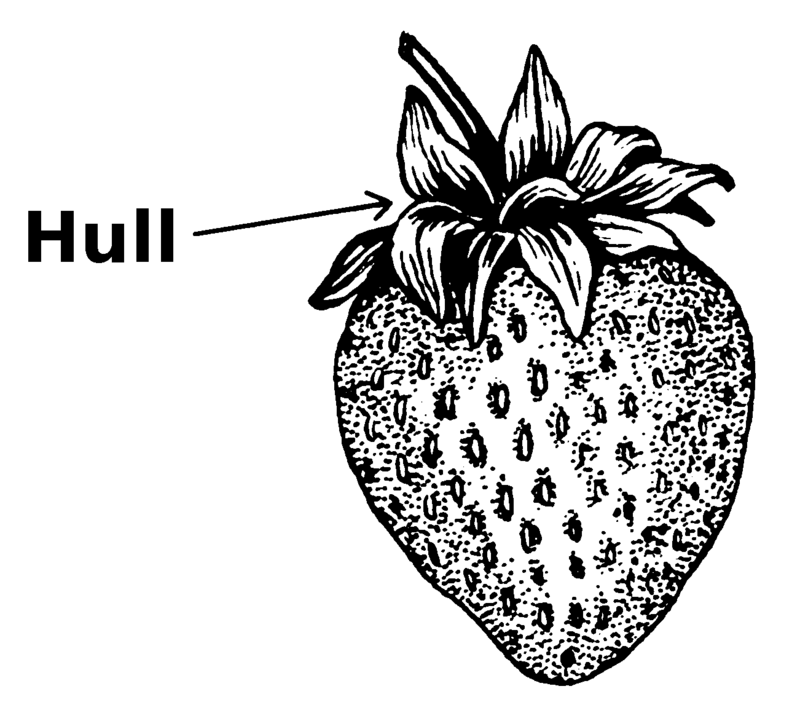 Make sure to not wash or hull the strawberries (a.k.a. taking off the leaves) until you are ready to use them. Instead, keep them in a moisture-proof container, on a piece of paper towel. This will help them stay fresh for 2-3 more days in the fridge. What if I want to freeze strawberries? If you want to freeze your strawberries to use down the road, no problem! 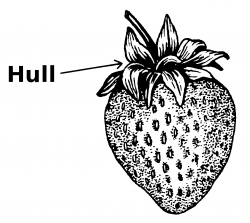 Make sure to hull the strawberries; lay them in a single layer on a pan and freeze them overnight. The next day, transfer the frozen strawberries into a plastic freezer bag and store in the freezer. It’s as simple as that! Frozen strawberries can keep up to six months to a year in the freezer. 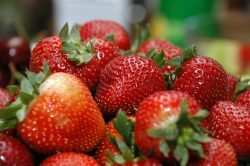 Want to learn all about strawberries? Head on over to The Spruce! In a large bowl, add the scallions, lime juice, lemon juice, salt, and pepper. Mix well. Add the red onion, sweet corn, and tomatoes (if you prefer to use them) to the bowl. Mix together. Jalapeno or poblano pepper: you can either use it uncooked or grill it over the barbecue or broil it in the oven for about 5 minutes on each side or sauté it over medium heat with a bit of oil to draw out even more flavor. If you cook it, make sure to let it completely cool before adding it to the bowl! Add the strawberries to the bowl. Mix together. Toss in the fresh cilantro. Note: Try not to keep the salsa overnight, as things get soggy and not-so-delicious the next day (we unfortunately speak from experience). There are is no wrong way to enjoy this salsa – only many tasty ways. You can use it simply as a dip for your favorite chips or nachos. Slap it on your tacos or burritos or quesadillas. Heck, put a spoonful on your burger! You might think strawberries don’t belong on such savory main courses, but you’ll be surprised! It doesn’t matter how you try it – we just hope you try it. And if you do, let us know what you think!